A few weeks ago, when I was composing my draft of post topics for the upcoming month, I chose to write about a well known but often under recognized figure, Florence Nightingale, as my public health figure. Little did I know just how suiting this choice would be given that May 6 is National Nurses Day. (National Nurses Week is from May 6-12). This month’s “Famous Name in Public Health” was a game changer in the structure of our health care system. It is because of her that the field of nursing became such an invaluable profession and why all of us should treat every day like Nurse’s day. So, let’s get started! 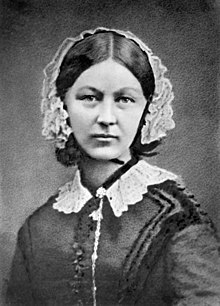 Florence Nightingale was born in 1820 to a wealthy family. In 1851, she completed her nursing training in Germany. At the time, the was not a well respected profession and her choice to pursue the career went against the norm for women of her status at the time and concerned her parents. You see, nursing was poorly paid and widely considered to be a job for the poor. There was a negative, unprofessional reputation surrounding nurses at the time. So why did Ms. Nightingale choose nursing? Her profound Christian beliefs made her feel that helping the poor and needy was her moral duty and that nursing was a call from God. When the Crimean War broke out in 1854, Florence became one of the many nurses that tended to the soldiers. She traveled to Constantinople from London where she worked at Scutari hospital, an under equipped facility. Ms.Nightingale was in charge of the female nurses working in Turkey. She worked in aiding the sick and wounded soldiers, as well as tending to their needs. Her staff improved the sanitation and conditions of the facility. They provided food, blankets, and even wrote to the soldier’s families. It was during this time that she earned her name, “Lady of the Lamp” because she would tend to soldiers by lamplight after the medical officers had retired for the night. Her endless care and morality improved the conditions of the hospital and of the patients. Her role and active leadership made the use of nurses in military hospitals an outstanding success. When Florence returned to England at the end of the war, in 1856, she campaigned for nursing reforms and increased sanitation in hospitals. Donations that she collected for the Nightingale Fund were used to start a nursing school at St. Thomas’ Hospital in 1860. She continued to campaign to improve health conditions in hospitals through advocacy and numerous publications. She authored more than 200 books regarding nursing, hospital planning, and facility organization, both in management and in literal floor plan designs of hospital wards. Florence used her prior education (a luxury of her family’s wealthy status) to evaluate and then revolutionize hospital systems. She set up a systematic record keeping system and found a causal link between sanitation levels and death rate. Her work was one of the first to recognize that social phenomena could be objectively measured and analyzed. She was determined to reform the health care system so the issues she encountered during the Crimean War would never impact civilians at home. Florence Nightingale’s reform efforts were so successful that soon there were nursing schools teaching her methods around the world. She was also involved in the creation of the International Red Cross. Through her work, she transformed nursing into a respected profession and her efforts did not go unnoticed. Florence received the Royal Red Cross in 1883 and then she became the first woman to earn the Order of Merit in 1907. Florence Nightingale passed away in 1910, but her legacy lives on.